Wish I could take credit for the quote in the above title. Can’t do it. Credit belongs to “Rick’s” response to Paul Woodward’sWar in Contextreaction to the treatment Vice President Joe Biden received from the Israeli government. On the day the Vice President began his peace-making trip in Israel, his host country announced the start of 1600 new housing units for the exclusive use of Jewish residents in East Jerusalem. Eli Yishai is head of Israel’s right wing Shas party. He is also the Interior Minister in Bibi’s government, which controls settlement housing. Yishai–who obviously ignored the “Biden is coming to town memo”–insisted the announcement of the 1600 new units was not intended as an insult. That excuse might be easier to swallow if it were not for the fact that the 1600 new units are but the latest in a long range construction Master Plan of 50,000 new units in East Jerusalem and the West Bank. So, of course, Biden did not leave town. Why pretend he was angry at an insult when the expanding Master Plan of 50,000 housing units insults the Palestinian people 24-7. Besides, Biden does not have any control over the checks the US sends to Israel. Those funds–$3 billion annually–are issued on orders from the US Congress, which in case you hadn’t noticed, is a wholly owned subsidiary of whichever government the people of Israel decide to put in charge of their future and ours. Instead of flying home in a twit, Biden hung around long enough to give Bibi a dressing down. One Israeli journalist reported on the conversation Biden had with Prime Minister Bibi Netanyahu in a private meeting. People who heard what Biden said were stunned. “This is starting to get dangerous for us,” Biden castigated his interlocutors. “What you’re doing here undermines the security of our troops who are fighting in Iraq, Afghanistan and Pakistan. That endangers us and it endangers regional peace. The vice president told his Israeli hosts that since many people in the Muslim world perceived a connection between Israel’s actions and US policy, any decision about construction that undermines Palestinian rights in East Jerusalem could have an impact on the personal safety of American troops fighting against Islamic terrorism. Mark Perry, writing on the Foreign Policy blog, gives an added dimension to Biden’s anger about his treatment in Israel. Perry writes that “Biden’s embarrassment is not the whole story”. On January 16, two days after a killer earthquake hit Haiti, a team of senior military officers from the U.S. Central Command (responsible for overseeing American security interests in the Middle East), arrived at the Pentagon to brief JCS Chairman Michael Mullen on the Israeli-Palestinian conflict. The team had been dispatched by CENTCOM commander David Petraeus to underline his growing worries at the lack of progress in resolving the issue. The January Mullen briefing was unprecedented. No previous CENTCOM commander had ever expressed himself on what is essentially a political issue; which is why the briefers were careful to tell Mullen that their conclusions followed from a December 2009 tour of the region where, on Petraeus’s instructions, they spoke to senior Arab leaders. But Petraeus wasn’t finished: two days after the Mullen briefing, Petraeus sent a paper to the White House requesting that the West Bank and Gaza (which, with Israel, is a part of the European Command – or EUCOM), be made a part of his area of operations. Petraeus’s reason was straightforward: with U.S. troops deployed in Iraq and Afghanistan, the U.S. military had to be perceived by Arab leaders as engaged in the region’s most troublesome conflict. The Mullen briefing and Petraeus’s request hit the White House like a bombshell. While Petraeus’s request that CENTCOM be expanded to include the Palestinians was denied (“it was dead on arrival,” a Pentagon officer confirms), the Obama Administration decided it would redouble its efforts – pressing Israel once again on the settlements issue, sending Mitchell on a visit to a number of Arab capitals and dispatching Mullen for a carefully arranged meeting with Chief of the Israeli General Staff, Lt. General Gabi Ashkenazi. . . . The day before the Vice President arrived in Israel, Bibi Netanyahu stood beside Pastor John Hagee at a Jerusalem rally at a celebration for Hagee’s Night To Honor Israel. At that event, Hagee, the Texas fundamentalist evangelical minister, was bragging about his ministry’s millions in donations to Israeli organizations. He also used the occasion to blast away in his rhetorical bellicose style against Israel’s “perceived enemies”. Biden was not set up, and the ministry report announcing an additional 1600 housing units in East Jerusalem, was not a surprise to Bibi. The Prime Minister’s focus is not on peace making with the Palestinians, but on war talk against Iran, starting with “tough, biting sanctions” against Iran, as he told his 1000 visiting Christian evangelical supporters. For Bibi, it is sanctions or else. Biden is now back in Washington, with nothing tangible to show for his mistreatment in Israel. He will have an opportunity to continue his conversation with Bibi Netanyahu when the Prime Minister arrives on American soil to speak to AIPAC at its annual Washington confab on Monday, March 22. Bibi speaks Monday evening. Will he repeat his apology? Or will he need to respond to Secretary of State Hillary Clinton’s speech Monday morning to Israel’s best US friends. Best, as in guardians of the Congressional coffers. Clinton expressed her own displeasure with Netanyahu in a 43 minute phone conversation, which did not need to be overheard. The Secretary ordered her media office to issue a statement about the heated exchange. Secretary of State Hillary Rodham Clinton on Friday delivered a stinging rebuke to Israeli Prime Minister Benjamin Netanyahu for his government’s announcement this week of new Jewish housing in east Jerusalem, calling it “a deeply negative signal” for the Mideast peace process and ties with the U.S. The State Department said Clinton spoke to Netanyahu by phone for 43 minutes to vent U.S. frustration with Tuesday’s announcement that cast a pall over a visit to Israel by Vice President Joe Biden and endangered indirect peace talks with the Palestinians that the Obama administration had announced just a day earlier. Leaders of the US Congress will attend the AIPAC conference this week. Some will be speakers. All are expected to be laudatory. After all, this is a pep rally. Hillary Clinton and Joe Biden have already told Bibi Netanyahu what they think about his flagrant foot dragging on the peace front. The AIPAC is a perfect opportunity for the two of them to speak with one voice and tell AIPAC exactly what they said to Bibi. And this time, why not bring up the matter of that $3 billion annual check from US tax payers. 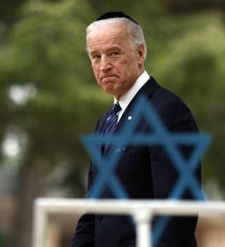 The picture of Vice President Joe Biden is by Ariel Schalit for /AFP/Getty Images. It was published in the London’s Guardian. 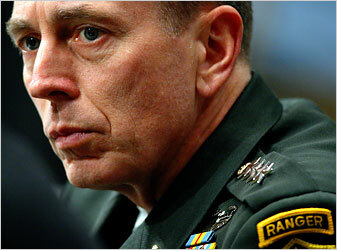 The picture of General Petraeus is from the War in Context web site. If this occasion were the first insult thrown at our government, or at the most an accidental slip of the tongue, by the Israeli Government, it might be excusable. Unfortunately it was the usual strategic utterance whenever the Israeli Government needs to whip up its lagging supporters, and simply one of hundreds over the past some fifty years, in the attempt to make our government toe the AIPAC line. Speaking of Mr. Hagee, whose organization apparently has no other deserving organizations to which to give money, other than Israel. When he came to Detroit last year to whip up the chorus for Israel, the guards at the door of the church refused admittance to a close personal Christian Palestinian friend who wanted to attend (who by the way supports a two-state solution with peace and justice for both). I was horrified. The insults to one of the highest officers of our own government don’t stop there. The Palestinian community over the years has been subjected continuously to insults and humiliations, bordering on racism and discrimination. And we seem to remain willing to fund such behavior. As the great poet said, “the mills of God grind slowly, but they grind exceeding small” (was it John Mill?) Has the time come when we must tell Israel what we expect for our largess, rather than the other way around? When our military commanders recognize that our foreign policy toward Israel affects the safety of our men and women in uniform, and say so to our President, a new day has dawned. Thank you for lifting up this news. US standards of responding to Israel have plummeted down so low particularly since Regan, that even I, as a Palestinian-American now appreciate the suddenly-found courage of Biden, Clinton, and Obama to respond to an israeli insult. I have learned over the years that the proof is in the pudding. If Israel continues building new development in Arab East Jerusalem, no American talk impresses me one bit. Netanyaho counts on that. Let us also find out how many times Clinton will bow down to Netanyahu nex t week in front of AIPAC, the supreme commander of American behavior. Thank you for this news analysis. To read the Washington Post (“Biden condemns move by Israel,” March 10), our Vice-President was shooting from the hip and acting like an ungracious guest. Three days later, we find that the US Administration is so steamed by this latest insult that they let Bib & co. have it. Now, Jim Wall shows us that they have to do this because they know that the word will eventually get out that they are sending young Americans to die in the ostensible struggle against “Muslim terrorism” but in reality to support Israeli expansionism. Fifty years from now, when Israel is gone and a public enquiry is made into the cost to the integrity of the American democratic system, the treasury, the lives of its young , and its former standing the the world, these exchanges will become part of the paper trail showing that American leaders were unwilling to do the obvious: stop the checks! Biden, Clinton, Axelrod and Obama should not have been surprised by Israel’s announcement. Peace Now had already been reporting that settlement expansion was galloping along in 34 West Bank settlements. These expansions were well publicized in foreign presses. Is it possible that Biden is that uninformed to be so shocked and awed? As Secretary Clinton issued her rebuke, people are applauding the possibility of a new US resolve. Possibly, just possibly, Israel has overplayed its hand and has really pissed off Obama. We can only hope this is so. While we were stationed in Jerusalem with the United Methodist Church, from 1994-96, we noticed then that every time James Baker got off the plane at Ben Gurion, the Israeli Govt. seemed to announce a new settlement in West Bank, or expansion thereof. Is this a planned agenda??? A dear Israeli friend and former professor of chemistry at Hebrew University, now deceased, told us several years ago that “Israel is engaged in ethnic cleansing of the Palestinians.” It seemed to us while we were there that the govt. of Israel simply wanted the Palestinians out, one way or another. I do not get it – stop sending money to Israel!!!!! I do not want my tax dollars spent that way. Is it making life difficult for us and our relations with the Arabs? Making our troops vunerable? Is that why we will stop the money? But what about folks in Gaza, the West Bank and East Jerusalem and all the other areas of the land grab with the Wall being built? Our money makes that possible. Then there is Hebron with the settlers hasseling Palestinian children trying to get to school. Do we only act when it affects our troops? shame on us. Again our US government has capitulated by verbal protests only. This has been going on Ds& Rs alike. We are told time and time again that Israel is our only “Democratic” ally in the ME. If 1600 homes for Jews only is supposed to be built, is that a demonstration of democracy? How do they get away with it? Could this be done in Chicago, Oslo, Rome, Paris , or London? We need more than verbal protests. This word about Centcom’s concerns about endangering US service personnel is intriguing. Maybe that will tip the balance a bit in Congressional deliberations. But what would putting Palestine/Israel under Centcom jurisdiction do? With what aim? The US military is already so intertwined with Israel (R&D and tactical theory) that it would take a lot to dis-entangle US interests from Israel’s. Would be very interested to know who comprised the “team of senior military officers from the U.S. Central Command” and whether it included any international law specialists. I have been for years arguing that the U.S. military will among the first, and worst, affected by any Israeli attack on Iran. It is obvious to anyone that Israel is trying to goad our government into doing their dirty work, while expoliting the zionist zeal of useful idiots like John Hagee and his cracker barrel constituency. And Joe Biden being shocked, SHOCKED to find them announcing new settlements the day of his arrival? Not sure I’m buying it… it reeks of a set-up, i.e., suspiciously like a P.R. ploy designed to appease the “Arab street”. I’ve long wondered why our government allows itself to be manipulated and hamstrung when in fact we write the checks for the Israeli adventure. So many of us in the U.S. who are fed up with the impasse and deceit. Those having interest in this topic should also check out http://www.IHR.org to learn more about the history of the conflict. Or better yet, read the book, ZIONISM, the Real Enemy of the Jews, by Alan Hart. Excellent historic expose of the U.S. complicity in the tragedy of the Nakba. Is that what you are hoping for? If so, why? Let us hope that the President will finally have the courage to stand up and to take a stand for meaningful peace negotiations with Israel and Palestine. It is so sad to see our President so ignored and illtreated. Three cheers for Biden and Clinton. The world waits to hear what Obama has to say. Harris Fawell, Member of Congress, retired (1999). You all are preaching to the choir. What about asking your congress persons to stop sending Israel money which they spend on illegal housing and weapons. Instead, send it where housing is needed – Haiti, Darfur, and New Orleans. Petraeus has said that his words were twisted and out of context. He remains a supporter of Israel. There is nothing in Perry’s report that suggests that Petraeus is not a supporter of Israel. The report, based on Perry’s conversations with Centcom people, focuses on Petraeus’ desire to have American troops engaged with Gaza and the West Bank, and not just Israel. My comment was to note that it would be an interesting new balance, given the military’s lockstep with the IDF. Can the US be allies with the Palestinians and the Israelis?